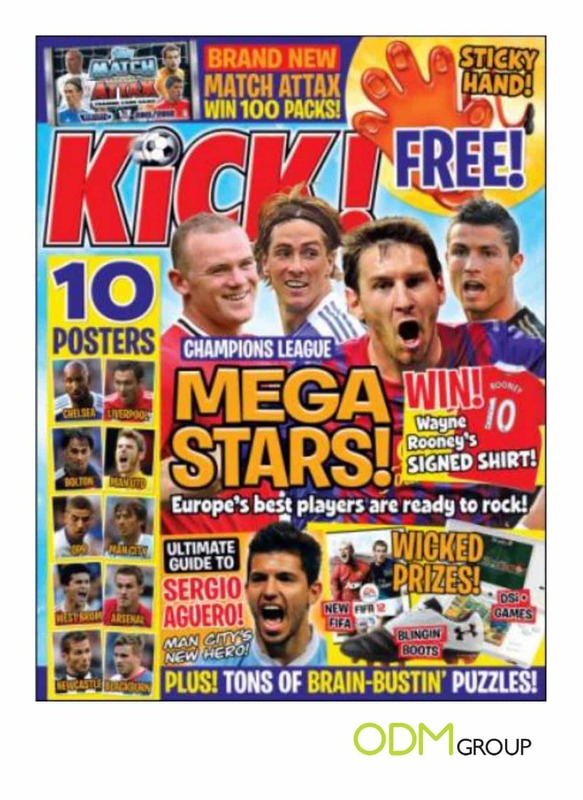 The magazine ‘Kick’ for football fans proves to be a hit especially when offering a promotional covermount gift with purchase. Purchasers of the Magazine received a free sticky hand toy. Kick magazine is a UK based monthly publication aimed at boys and girls aged 7-14. Visual – The magazine with its bulky appearance, extra packaging and lettering notifying of the free covermount is an instant attention grabber. Incentive – They give a reason for picking one magazine over another. They boost sales – Sales of Magazines with Covermounts are proven to be boosted in the short term. Promote impulse purchase – consumers might not consider the magazine until they notice the covermount and then make a quick decision to select it to receive the gift. Free Marketing tool – All it takes is for the magazine to brand the item and then the customer through use of the item offers a free marketing platform. Young readers love gifts – A child will simply want something to play with, a student will see the use of the covermount and want to buy the magazine to save buying the product separately. A woman will always want to add to her collection of make up items. Young people are more ready to part with their money in return for entertainment and material pleasure.